Penne, cream sauce, house pomodoro sauce. Fettuccine with roasted mushrooms and cream sauce. Marinated in our house blend of spices and grilled to perfection. Mozzarella, cream cheese, roasted eggplant, roasted mushroom, basil, dried cranberries, parsley. Marinated sea bass, roasted baby corn, roasted sweet potatoes, and maple glaze. Mozzarella, cheddar, jalapeno, cream cheese, basil, parsley, cilantro, served with black eggplant cream. Pan fried cauliflower, crispy red quinoa, cherry tomatoes, fresh herbs, served on a bed of yogurt tahini sauce. Toasted baguette slices, pesto cream, red onions, tomatoes, feta. Artichoke hearts, stuffed with ricotta, mozzarella, spinach, fried onions, served with lemon tomato butter sauce. 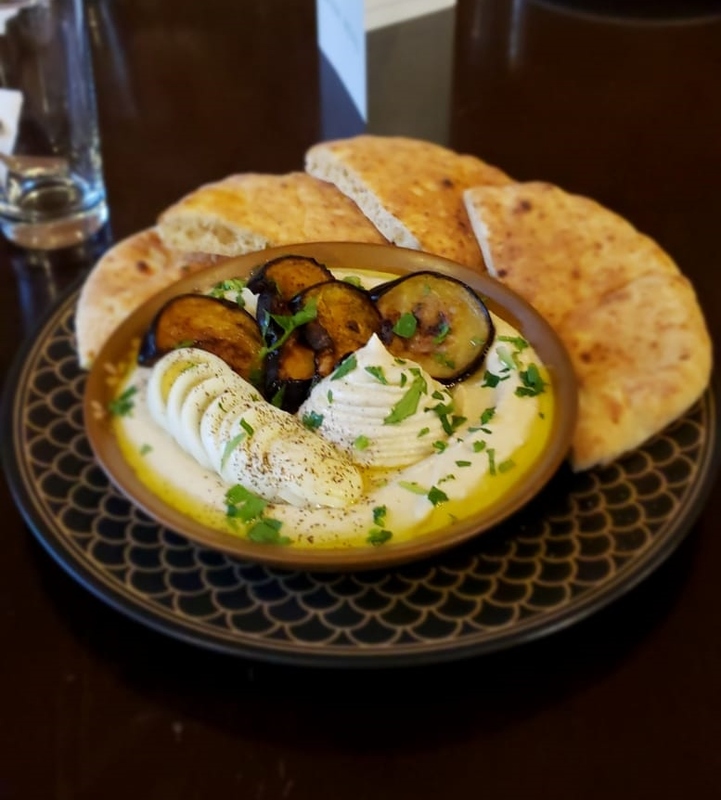 House middle eastern hummus, served with Zaatar pita chips. Breaded cauliflower coated in our house barbecue sauce. Omelettes served with house salad, baguette or pita, and potato wedges. Served until 3:00pm. Two eggs, fresh mushrooms, fried onions. Two eggs, mozzarella, and cheddar. Two eggs, feta, tomatoes, red onions, and black olives. Two eggs, smoked salmon, parsley, mozzarella cheddar. Two eggs in our house shakshuka sauce. Add: Eggplant 1, Sweet potato 1, Jalapeno 1, feta 2. Hummus plate filled with tahini, grilled eggplant, and a sliced hard boiled egg. Hummus plate filled with hot shakshuka and a soft cooked egg. All sandwiches can be made in wraps. Served until 3:00pm. Smoked salmon, cream cheese, lettuce, tomato, two sunny side up eggs. Tehina, hard boiled egg, roasted eggplant, parsley, potato, sweet chili, roasted garlic. Two egg omelette, cream cheese, lettuce, tomatoes, cucumber, red onion. All paninis can be made in wraps. Served until 3:00pm. Pesto mayo, mozzarella, cheddar, tomatoes, kalamata olives, red onions, mushrooms. Marinara sauce, cream cheese, mozzarella, cheddar, green olive. Goat cheese, roasted mushroom, roasted peppers, tomatoes, fried onions, pesto. Tuna salad, sliced hard boiled egg, tomato, mozzarella, cheddar, pickles, fried onion, thousand island dressing. Grilled salmon, cream cheese, pesto mayo, black olives, sweet potato, tomatoes, red onion, caesar dressing. Roasted eggplant, roasted peppers, feta, fresh basil, grilled zucchini, marinara sauce. Avocado, feta, tomatoes, green olives, red onion, pesto mayo. Red quinoa, romaine hearts, spinach, tomatoes, cucumber, feta, sweet potato, roasted pepper, red onion, dried cranberries, baby corn, lemon dressing with a touch of italian dressing. Romaine hearts , tomatoes, cucumber, red onion, kalamata olives, feta, za’atar, and olive oil lemon dressing. Romaine hearts, turnip, red onion, pickled celery, tomatoes , cucumber, hard boiled egg, scoop of tuna salad. Creamy nicoise dressing. Romaine hearts, cherry tomatoes, croutons, parmesan, caesar dressing. Romaine hearts, spinach, avocado, tomatoes, roasted peppers, cucumber, feta, sun-dried tomatoes, olive oil lemon and caesar dressings. Kale, red onion, pear, mango, pecans, radish. balsamic, lemon, and orange dressing. Arugula, mixed green, cherry tomato, cucumber, sweet potato, beets, carrots, red onion, goat cheese. Orange lemon dressing. Tomatoes, cucumbers, red onions, with oil lemon dressing. Mix green., augula, cherry tomatoes, cucumbers, endive, cauliflower, dried cranberries, red onion, cilantro, served on a bed of yogurt tahini sauce and drizzled with olive oil and lemon. House pomodoro sauce, mozzarella, mixed olives. House pomodoro sauce, mozzarella tomatoes, fresh mushrooms, red onion. House pomodoro sauce, mozzarella, ricotta, arugula. House pomodoro sauce, mozzarella, pineapple, jalapeno, red onion. House pomodoro sauce, mozzarella, oyster mushrooms, portabello mushrooms, truffle oil. House pomodoro sauce, mozzarella, cream cheese, smoked salmon, scallions. White sauce, mozzarella, feta, ricotta, and parmesan. Cream sauce, mozzarella, artichoke hearts, spinach. Rose sauce, mozzarella, grilled salmon. Spaghetti, house pomodoro sauce, black olives, red onions, tomatoes. Penne, pomodoro sauce, cream sauce, roasted mushrooms, red onions. Spaghetti, carrots, zucchini, red onion, mix peppers, garlic, Asian sauce. All fish entrees come with choice of 2 sides. All fish and side dishes come in contact with dairy. Salmon, red quinoa, scallion, red onion, pickles, tomato, roasted mushroom, garlic mayo, fried onion. Served on a pretzel bun. Served with spicy or regular home fries. French style seared tuna marinated in balsamic, topped with sliced cherry tomatoes and kalamata olives. Butterfly branzino marinated in our house spices and seared to perfection. Seasoned red snapper in our house blend of spices and cajun sauce, and seared to perfection. Pan seared chilean sea bass with maple glaze. Salmon fillet baked in a beet infused tomato stew, baguette, grilled jalapeno, side salad, tahini. Chilean sea bass baked in a beet infused tomato stew, baguette, grilled jalapeno, side salad, tahini. Pita stuffed with ground white fish, fresh herbs, lemon zest, middle eastern spices, served with a garden salad, tahini, and "amba" pickled mango. Hand cut fries with truffle oil and parmesan. Breaded button mushrooms pan fried and coated with our house pesto and sweet chili. *Contains Sesame. Hot chocolate topped with whipped cream & crushed mekupelet. Shot of espresso over a scoop of vanilla ice cream. Made with nana fresh leaves. Ice, house brewed coffee, milk. Flavors: Caramel, hazelnut, french vanilla, sugar free caramel, sugar free hazelnut, sugar free french vanilla. House blend of fresh fruit made into mix over ice. Fresh nana, lemon juice, crushed ice, and sugar. Flavors: chocolate, vanilla, mix. Topped with whipped cream. Vanilla ice cream, oreo cookies, milk, topped with whipped cream. Vanilla ice cream, milk, house strawberry syrup. House made caramel, vanilla, milk, topped with whipped cream. Vanilla ice cream, israeli coffee, milk, topped with whipped cream. Chocolate hazelnut sauce, espresso, ice, milk.